For me, the phrase “veal scallopine” conjures up a luxe American restaurant circa 1960. I see starched linens, heavy drapery, and low lighting. Power brokers rest on plush banquettes and sip vintage Bordeaux. Sauce rich with demi-glace and cream pools on their plates. Afterwards, the men pass cigars and, over snifters of brandy, praise the chef’s mastery of Continental cuisine. Dinner has been pure pleasure. No one feels guilty about much of anything, including what (or how much) they ate. Like those three-martini meals, veal scallopine now seems like a dish of the past. Growing up in Wisconsin with a veterinarian father, I saw newly born calves pulled away from their mothers to be crated for veal production. Veal raised like this has fallen out of fashion, and for good reason. In recent years, many restaurateurs have begun to bring butchering responsibility into their kitchens. Whether for reasons of thrift, challenge, or respect for the creature that gave its life, more restaurants are making use of an entire animal and challenging diners to eat nose-to-tail. Menus reflect this trend: headcheese terrines, gelatinous braised trotters, and hearts charred on the grill. In this context, scallopine seems passé. Look at its user-friendly architecture: Slices of lean meat are trimmed of all fat and connective tissue and pounded to a point of thin tenderness. 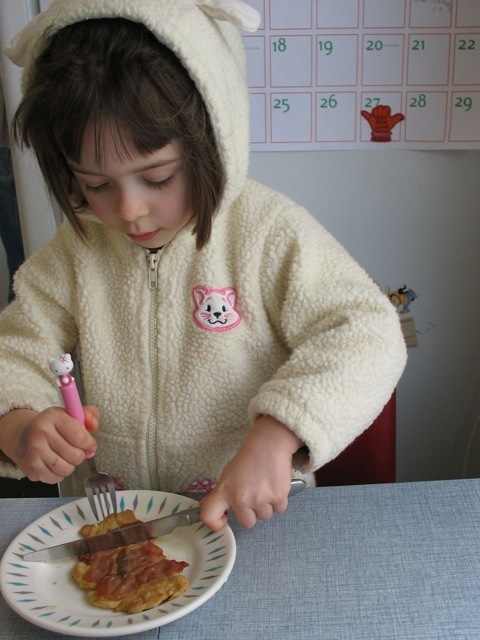 That’s for amateurs, or children just getting the hang of the knife-and-fork routine. 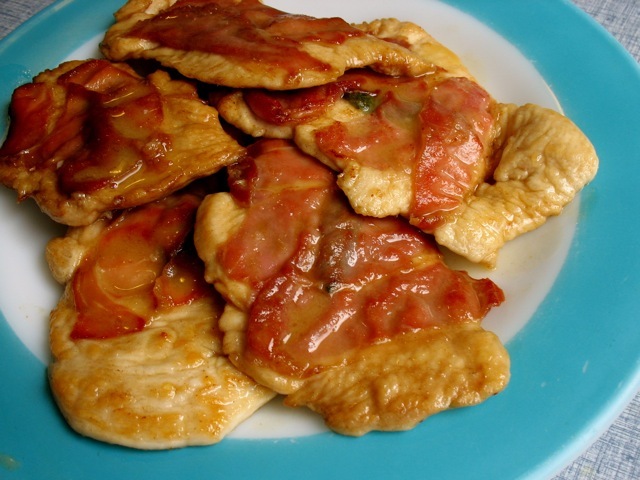 If you do see scallopine, it’s likely made from chicken or turkey breast. That just cements its bland image. But recently I found myself impressed by the scallopine cut’s incredible utility. Ironically, it happened while I was deep into a nose-to-tail project. We had butchered a milk-fed pig at the restaurant where I am a sous chef. Happily, our fair diners had consumed just about everything on that animal. Except for one leg. Pork leg muscle is lean and tightly knit, with the potential to be tough and chewy. A roast was out of the question. Brining would have tenderized the meat, but we didn’t have the time necessary to soak a chunk of meat that big. Instead, we separated the muscles and cut them across the grain into ½-inch cutlets. We pounded those into ¼-inch thick scallops — yes, scallopine. Cutting the muscle fibers against the grain released their tension, and pounding the cutlets further tenderized the densely textured meat. 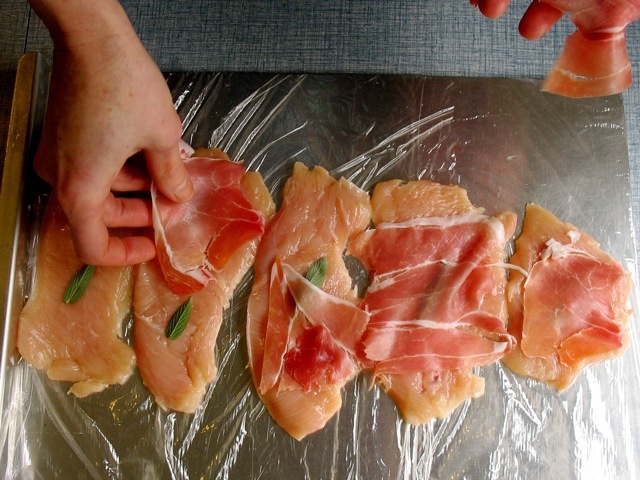 That night, we went old school and put pork saltimbocca — sautéed with sage, prosciutto, and white wine — on the menu. It was a bestseller. Good candidates for homemade scallopine abound. Turkey tenders, chicken breasts, and pork loin are all good substitutes for veal and, unlike veal, are widely available. White meats can be bland, but they go well with countless ingredients and flavors. Unless you buy meat in cutlet form, the commonly available choices in poultry are boneless and skinless chicken breasts or turkey tenders. For pork, buy tenderloin or center-cut boneless pork chops. 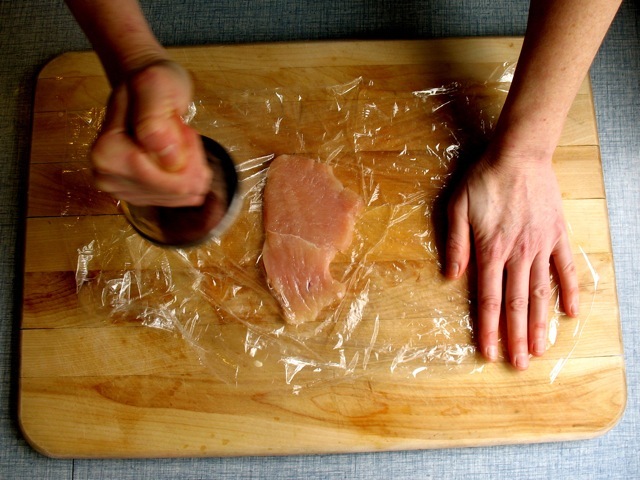 For chicken, trim any fat and connective tissue off chicken breasts. 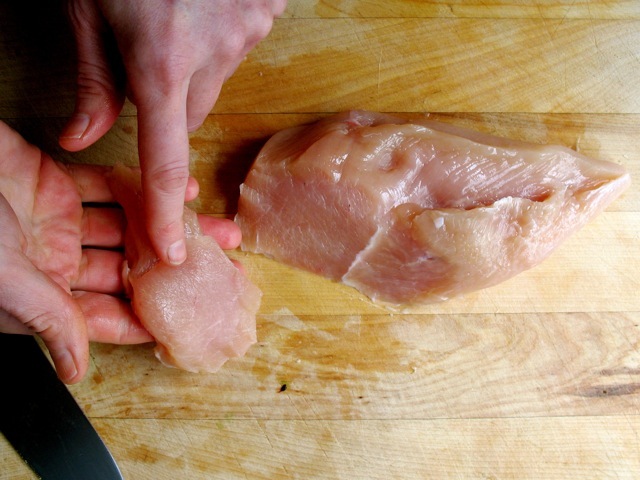 The muscle in chicken breasts runs at an angle, so the way to cut across the grain is to slice at a bias. Holding your knife at a 45-degree angle, cut ½-inch thick slices of breast meat starting at the narrow end of the breast. Breast halves that are smaller, at about 6 ounces, can simply be cut in half crosswise. Larger breast pieces will produce five to six cutlets, or more. Place one slice at a time between two pieces of plastic wrap. Dip a meat pounder in a bowl of cold water. (This helps it slide across the surface of the plastic wrap.) Starting in the center of the cutlet, push down and outwards with a meat pounder. You want a sliding motion that gradually flattens the meat without tearing it. Repeat until the scallop is ¼-inch thick. A tendon runs down the length of turkey tenders. However, these are barely noticeable once they are pounded thin. It’s worth overlooking this drawback for the flavor of the turkey, a far worthier approximation of veal’s flavor than pale chicken breast. Cut turkey tenders at a 45-degree-angle bias cut, just as you would with chicken. Be careful when pounding them out; as their name suggests, turkey tenders are delicate and easily torn. Pork tenderloins are easily cut crosswise into scallops and pounded. A boneless loin chop must first be sliced in half, parallel to the surface. You will then need a pounding mallet that has tenderizing spikes on one side. Hit the cutlet a few times with the tenderizer side before pounding it with the smooth side. Once your scallopine are ready, prepare them in a classic Italian style, such as saltimbocca or piccata. These recipes contain just a few ingredients, yet they’re well balanced. There is acid in the white wine and lemon juice, a salty accent in the prosciutto and capers, and a final soft touch of sweet parsley and butter. Cooking time is minimal, merely a short sizzle in a hot skillet. After the scallops are dusted with flour, they’re sautéed briefly in butter over medium-high heat. The flour prevents the cutlets from sticking. Some of the flour falls into the hot butter, where it browns and makes crusty bits to scrape off the bottom of the pan into the sauce. This gives scallopine dishes a richer flavor than you would expect from a preparation so swiftly executed. Experiment with sauces. In the spring, try a sauce of tarragon, cream, white wine, and Dijon mustard. In early fall, swirl butter and syrupy balsamic vinegar into diced ripe tomato and strips of basil. Follow these instructions and you’ll have a quick-cooking dinner both elegant (it’s got a sauce!) and accessible (you can cut it with a butter knife!). Furthermore, with a little minor butchering on the part of the cook, scallopine adapts itself to everything from supermarket chicken breasts to entire legs of pork. That’s not passé; that’s modern. p(bio). Kelly Myers is a chef and writer in Portland, Oregon.